Also known as old fashioned or pot marigold, fresh petals add pizzaz to salads or as garnishes. Petals are edible. Plants available in a 2x3 inch cell. All transplants are certified organic. Select here for transplant information, pick up and order dates. 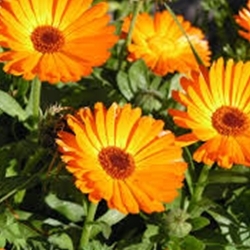 An early blooming medly of bright orange, pale yellow and bright yellow flowers. Multi-branching 12-18 inch plants with single and double blooms.